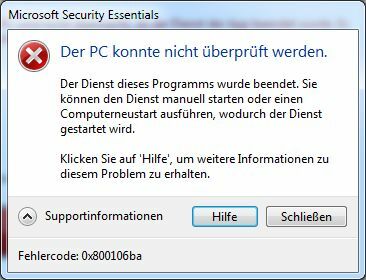 [German]On March 19, 2019, Microsoft had a worldwide issue for several hours with its antivirus solutions (Windows Defender, Microsoft Security Essentials, System Center Endpoint Protection). Especially the failure of System Center Endpoint Protection (SCEP) hit enterprise customers hard. The reason: The signature definition 1.289.1521.0 (and 1.289.1512.0) caused MsMpEng.exe to crash. Microsoft has fixed this bug in the meantime. Unfortunately I could not react promptly, because I was out of office and a car malfunction (somewhere in the ‘pampa’ knocked me out for 3 days. But within my German blog, the discussion went on without my interaction. On all my PCs & servers with SCEP I currently notice the problem that they crash with the engine 1.289.1521.0 while scanning. There are reports [TechDowns, reddit.com] confirming this issue. This issue affected System Center Endpoint Protection (SCEP) in a corporate environment, Marco R. was responsible for. Bleeping Computer reported here error code 0x800106ba occurs on computers running Windows 7, Windows 8.1, and Windows Server 2003, 2008 and 2012. 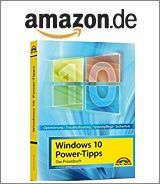 German blog reader Michael reported and correctly stated that the signature file with version 1.289.1521.0 caused the problem. On the WSUS the definition file for version 1.289.1521.0 were withdrawn on 03/19/2019 at 16:40 o’clock, as Michael informs here. Woody Leonhard picked it up here, Defender has a definition file issue (which affects all Microsoft anti-virus solutions) – thanks to Julia for the link – and my thanks to the other blog readers who have discussed the topic in the comments. 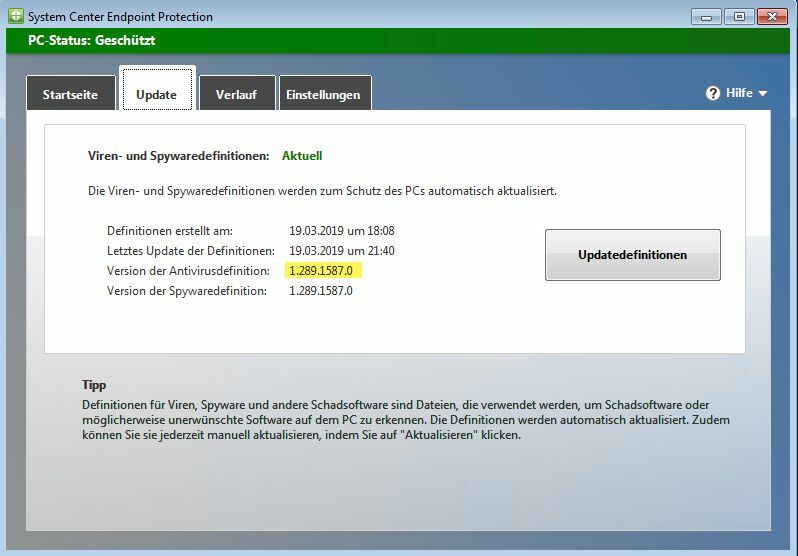 Blog reader Marco R. informed me by mail later in the evening, March 19, 2019, that the System Center Endpoint Protection (SCEP) with the SCEP signature 1.289.1587.0 was working again. I then assumed that the scan engines of Windows Defender and Microsoft Security Essentials (MSE) also got the update. A short text under Windows 7 with the MSE showed me that the signature file 1.289.1599.0 is installed and the antimalware protection engine can scan without errors. The bug should therefore be fixed for all Defender, MSE and SCEP systems after updating to the new virus definition. However, the bottom line is that Microsoft’s antivirus solution was dead for several hours. I got an information from the editorial staff of German site heise.de. A reader responsible for a state computer center service provider reported that many customers had problems with System Center Endpoint Protection (SCEP) for hours. A ticket opened at Microsoft in the afternoon of 03/19/2019 was categorized there with the highest possible rating ‘Severtity A’. All Microsoft’s antivirus solutions were ‘blind’ for hours – not good. A Microsoft spokesperson told Bleeping Computer: We’ve resolved this issue, which appears to have been limited to Windows 7 and Windows Server 2008. Seems a good joke so far. This entry was posted in Security, Windows and tagged Security. Bookmark the permalink.